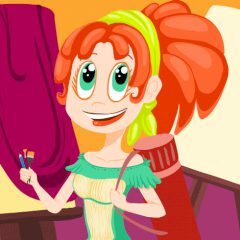 Art Fever is a find the object game with eye catching hand drawn graphics describing how someone can become an artist. The girl in the game has to find five objects randomly selected from a growing list of possible objects. Every level has a timer limit of one minute , but there is no real end game screen, if the timer runs out the level is restarted. Between each level there are different bonus stages that gives you the chance to win a time bonus for the next level. This game is not meant to be frustrating in any way, the game is a little fun experience with some beautiful hand drawn graphics to complement it.